Makes 4. Preparation time 5 minutes. Cooking time 5 minutes. • Roast a few extra sweet potatoes in the coals and set them aside for this dish. Alternatively, if you're short on time, peel, chop and cook the sweet potato until tender. Mash with as much butter and cheese as you prefer, until fluffy. 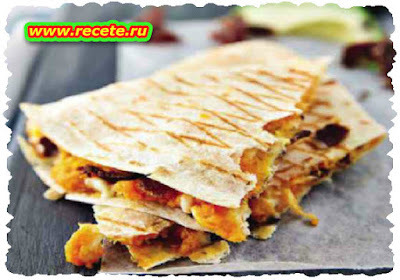 • Spread a few spoonfuls of sweet potato on a tortilla, about 0,5 cm thick. Scatter over the biltong slivers. Place another tortilla on top and heat a griddle pan until it's smoking, or braai on a grid over moderate coals. Grill the quesadilla for a minute on each side until the cheese has melted.